Hello Katie Girl: Color Heaven! 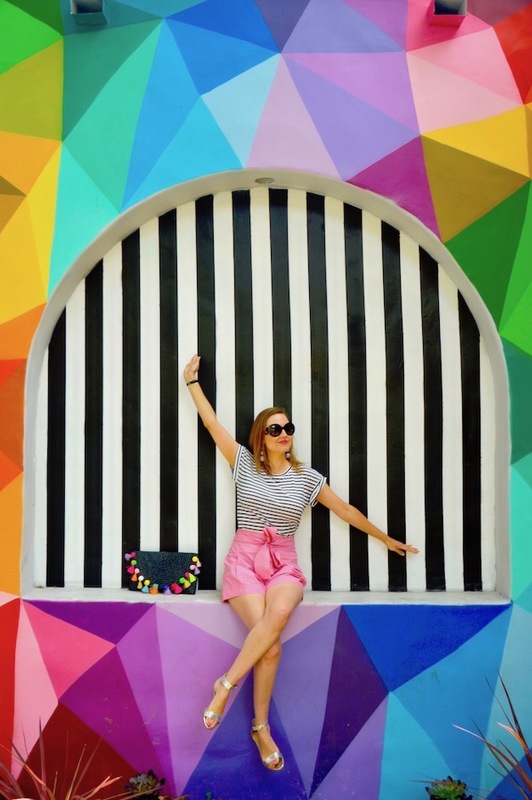 It's no secret that I love colorful walls and murals! 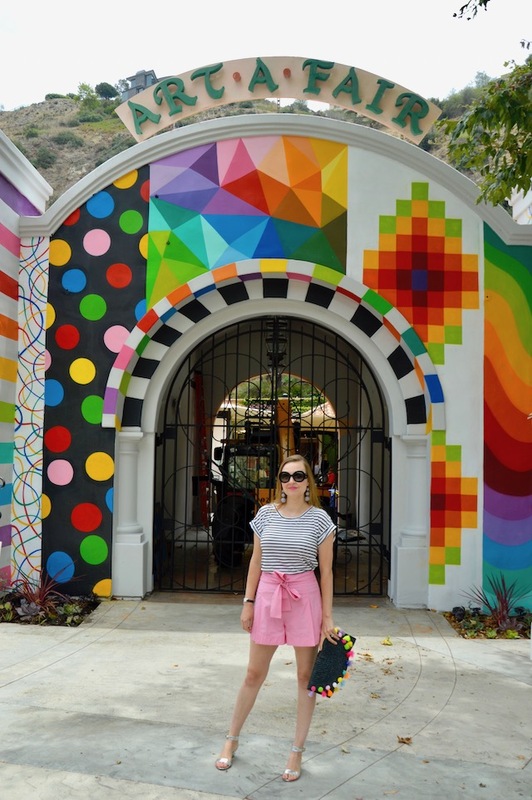 What if a place existed that wasn't just one colorful wall but, instead, an entire building painted as a gigantic, colorful mural? Truly, that would be my idea of color heaven! Well, the good news is such a place exists and it's at the Laguna Art-A-Fair! Yes, I definitely felt like I had died and gone to heaven in this place. 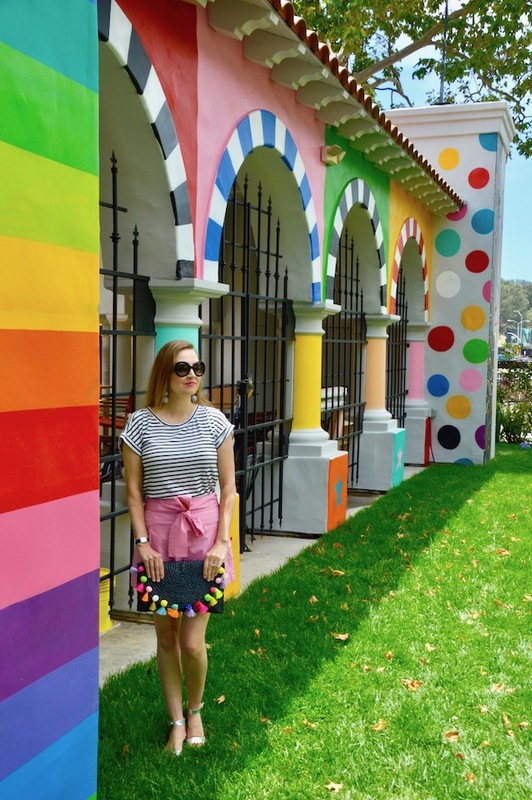 You know, if I could paint my house like this I probably would but sadly, both city property laws and, more importantly, my husband would never allow such a thing to happen! The mural for the Art-A-Fair building was done by the artist Okudart and it was definitely a feast for the eyes! In case you were wondering, Art-A-Fair is a fine arts festival that takes place in the summertime in Laguna Beach, California. We went to the building about a week before the festival started so that we'd have the place all to ourselves! Obviously, you don't want to do crazy poses like the one above in front of a large crowd, although maybe I could just pass it off as performance art? 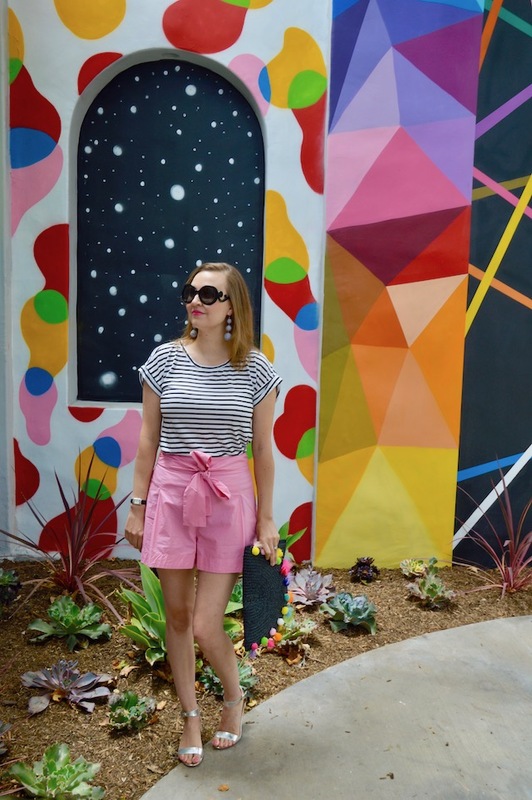 Since there are so many amazing colors in the murals that wrap all the way around the building, I decided to go simple with my outfit, opting for just a striped tee and these tie pink shorts from J. Crew factory. As I discussed in my last post, the summer sales are hot right now and these shorts are definitely one amazing deal! 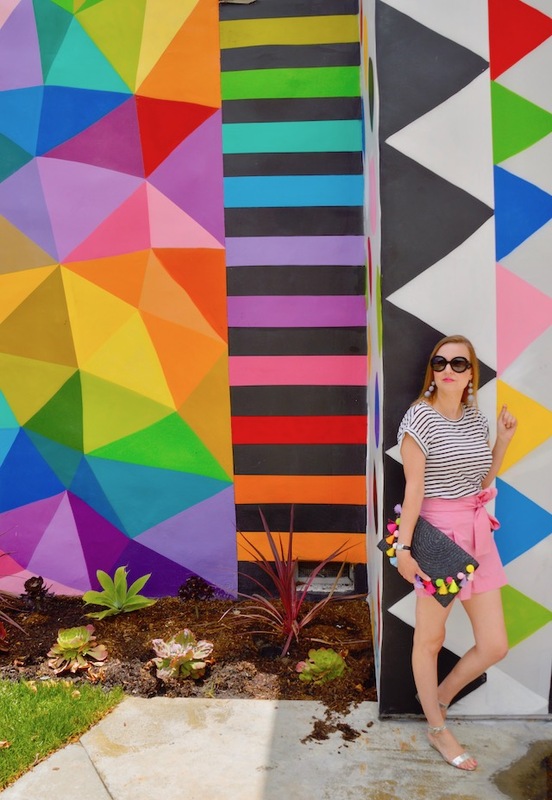 I also love how my pom pom clutch literally picks up just about every color in the mural! 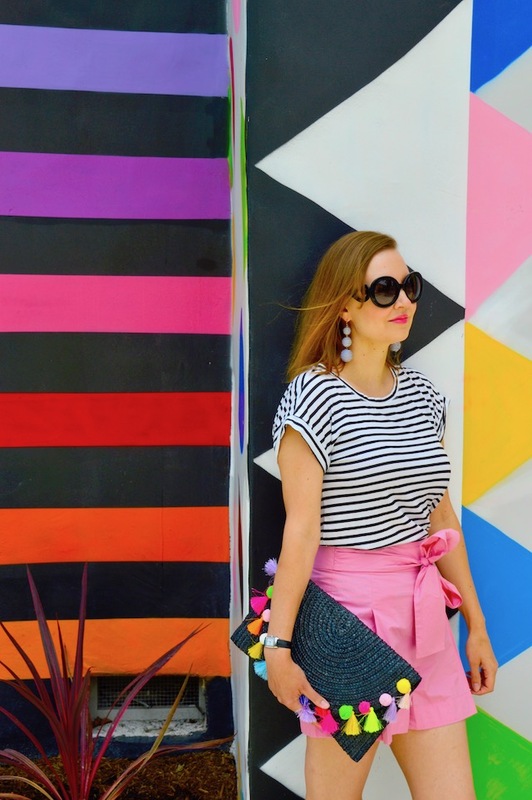 Between my stripes and color palette, I think I blended in nicely with all of the art work around me, yet at the same time still stood out. Oh M Gee! All these colors are a feast to my eyes! I too just love colors. Something about them that just makes me so happy and peppy! Lol Cute outfit and you definitely blended in nicely. Those pink paper bag shorts look so comfy to wear and a nice way to beat the heat. Of course, your clutch is fabulous! 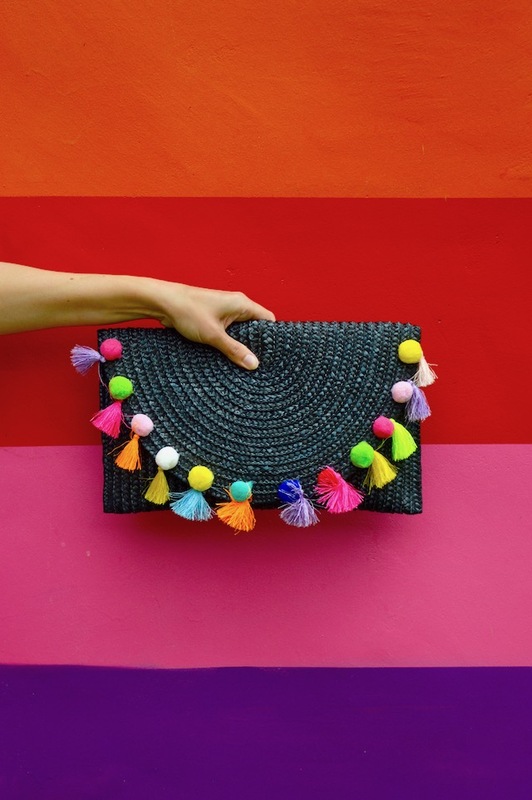 Those pom/tassels are just too adorable - I can't get enough! All those colors are so much fun! I can see why you loved this place so much. It fits your personality and style so much! 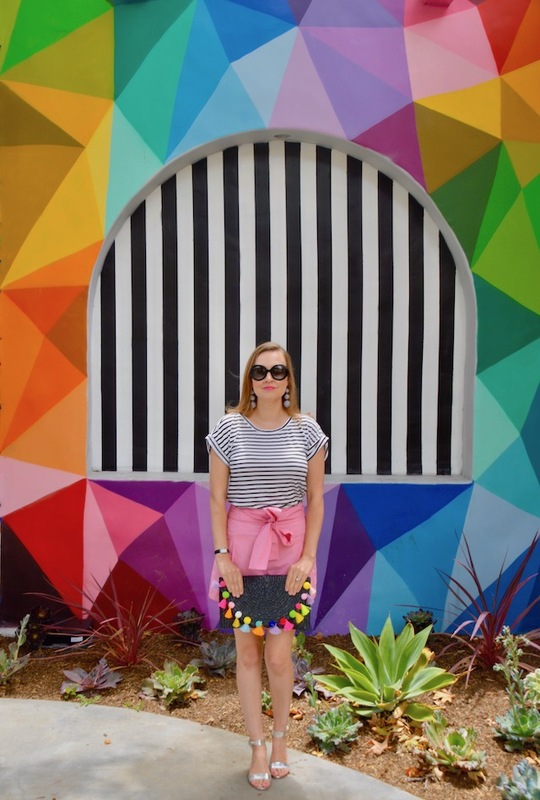 What a fun building, and you couldn't have picked a better outfit to go with it. 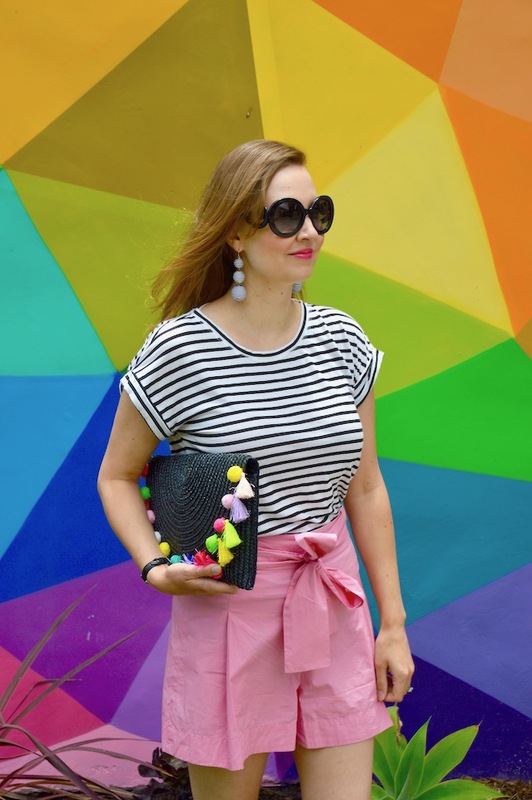 I love the mix of stripes and bright pink, and the pom pom + tassel clutch is the perfect way to finish the look. LOVE it! This outfit and those walls and all of its beautiful artistic colors and patterns are totally you and so me too. You know I love color. Love every piece you are wearing especially the shorts. Great clutch too, Katie! You should link this today with our special "Skirt-themed" linkup below. Any cute Summer outfits are welcome!